No fancy malls or boutiques on Flores. It doesn't have the huge collections of woodcarvings or paintings like on Bali. Still there are some nice things to take home. Ikat is a weaving technique which is used on several islands in Indonesia. Especially the islands of NTT are famous for their ikat, including Flores. Every regency has it's own pattern. Ende, Maumere and Labuan Bajo have some ikat shops. Also for sale on the markets. You also can buy directly from the weaving village like Watublapi or Bena. The local ginlike spirit is a way of life on Flores and part of the adat (tradition). It is best to drink it pure or mixed with lime and honey or with orange juice. Maybe you would like to take a bottle to your home country (in your suitcase! and well packed). 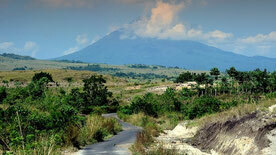 The best moke is sold in Larantuka and comes from Adonara. 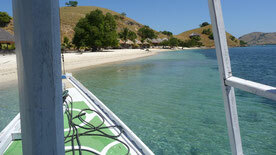 On your tour through Flores you can also buy moke in Aimere, Mbay or Labuan Bajo. Near Nangapanda in Ende regency are some stretches of beach with blue/turquoise stones. The demand is high enough to make it an export product for Bali, but also for other countries in Asia like Japan, Taiwan and South Korea. You can also collect a few yourself on the beach. At home they are at best kept in water in a glass vase to enjoy the bright colours. You will return home with lots of MB's to keep your memory of Flores alive. 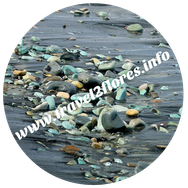 Coral and (big) shells, even found on the beach are not allowed to take out of the country. Keep in mind that the securitycheck in Labuan Bajo is keen on that. * To clear misunderstandings about moke (arrack). The last few years the consumption and processing of arrack is frequently in the headlines. People have died after the consumption of arrack on Bali, Jawa and Sumatera (including tourists). In my opinion moke on Flores is safe to drink and besides that also a delight to drink. It is pure without additions. 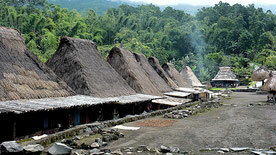 Keep in mind that moke on Flores is part of the tradition and always a good suggestion to make friends. No need to worry about moke on Flores. Enjoy. No ratio, just mix as you prefer. Cheers!